This week – as a good chunk of North American sat under the infamous polar vortex – as cold weather records were broken all over the country – in the midst of all the -30 degree temperatures we experienced here in Penhold – this week, I put in my order for my garden seeds, perennials, and fruit trees. I think ordering seeds in February is a great expression of faith. I have faith that winter will not last forever. I have faith that spring will come and things will grow in my garden once again. There’s a great verse in Romans that speaks to this issue. I think that describes every Canadian every winter. We hope for what we do not see, but we must eagerly wait for it with endurance. Well, this morning, I’m not really intending to talk about the weather and not even so much about faith or hope at this point – but rather, I want to talk a bit about gardening. Some of you know that I like to dabble in gardening and landscaping and all that good stuff. It’s one of my hobbies that keeps me busy in the summertime. And for the most part, I think I’m pretty good at it, but you won’t know that by looking at the plants we have in our house right now. But when it comes to my indoor gardening, most of our house plants struggle to stay alive. 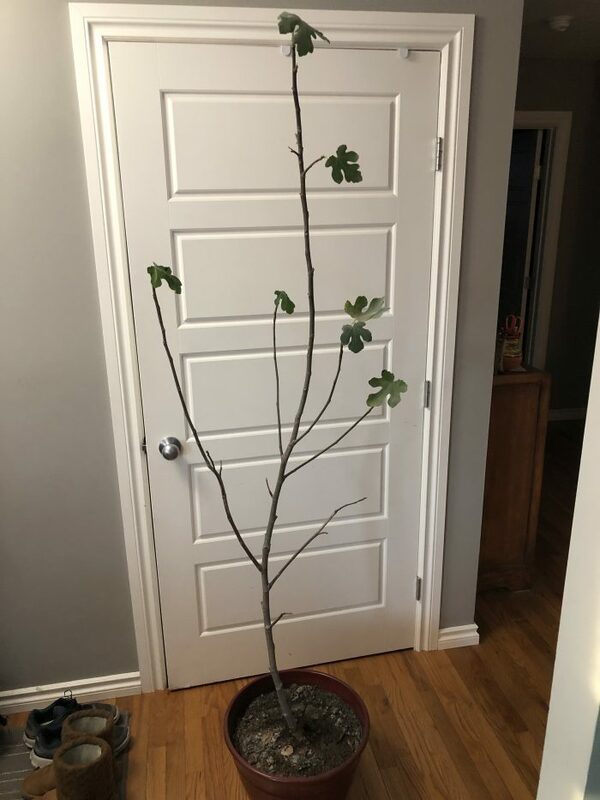 I bought a fig tree on a wim last spring – but of course, fig trees can’t survive in this kind of winter, so brought it in to the house last fall. Well, this week, I snapped a picture of it for you so you can see just how well it’s doing. This is my fig tree. As you can see – it is not exactly thriving. It is barely surviving! It’s got like six leaves on it. 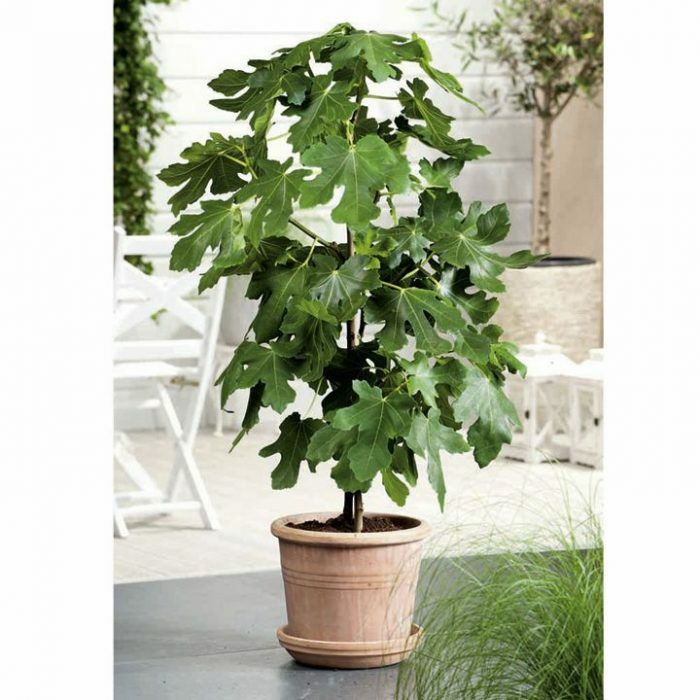 Now just to give you a comparison, here’s a picture I found of a healthy, flourishing fig tree. That’s what my fig tree should look like. There’s a significant difference there. And there’s a lot of reasons for that – it’s winter, so there’s not much sun in general. Our house doesn’t have any good south facing windows, so that really minimizes the sunlight. The pot it’s in is much too small for the size of tree it is. And I rarely make the effort to give it any fertilizer. So while I think it will stay alive until spring – I’m pretty confident that there will be next to zero growth and there will certainly be no fruit – no figs this year. It’s surviving, but it’s certainly not thriving. Now I want you to keep this image of my fig tree in your mind – we’re going to come back to it in a little while, so just hold on to it for a bit. But first, I remind everyone what we’ve been talking about for the last several weeks. We’ve been talking about the church in your house. As Christians, everyone of us is part of a little church that gathers in your home. It’s not a housechurch, per se, it’s simply called your family. And each of us play a role in our own little church called our families. Now the roles are all very different – some of us are married, some of us are not, some are parents, some of us are grandparents, some of us are children, some of us are single, some of us live with families other than our own – at different times in our life we will find ourselves playing different roles. But regardless of what role we play in our families, it’s important that we understand what our role is and that we carry it out to the best of our abilities. Now so far, a major part of our focus has been on the roles and responsible of husbands and of wives. A couple weeks ago, Greg shared a bit about the role of parents and children – and what responsibilities come with each of those roles, but so far, the bulk of our conversation has centred around the role and responsibilities particularly of husbands. And if you’re not a husband, I apologize for three weeks of messages that aren’t really geared for you – but I think these are important Biblical instructions for husbands – in world that just doesn’t teach this stuff. But we are going to wrap up the husbands side of things this week and next week we will begin looking at the roles and responsibilities of wives. But I do hope in all of this, that everyone – whether married or single or whatever your role – is able to glean some good Biblical principles – applicable for where ever you’re at. And I will remind you once again that we are looking at all of this through the lens of Christ’s relationship with the church. The Bible tells us that our marriage relationships are a reflection of Christ’s relationship with his church. The husband is to take on a similar role to that of Christ and the wife is to take on a similar role to that the church. Our roles and responsible in marriage are to be modelled after the roles and responsible of Christ and his church. Our key passage in all of this has been Ephesians chapter 5 and I’ll just a read a short passage starting at verse 21 to set the stage today. This is where we’ve been focusing for the last few weeks. Now a lot of people get upset when the church teaches about husbands being the head of their wives and wives submitting to their husbands. But if you’ve been with us for these past few weeks, and you’ve starting seeing what it means for the husband to be the head of the wife, I hope that you’re seeing that this isn’t anything like the oppressive, demanding, overbearing image of a husband that some people have. So far we’ve seen that being the head means being a servant – it’s leading with a towel – being willing to wash the feet of the ones we lead so that they can be spotless and clean before God. That’s precisely what Jesus did for us. Then last week we looked at how being the head of the home means being the example in holiness, in love, in repentance, in worship, and in Christian maturity. It means drenching your home in the Gospel – so filling your house with the Word of God by your actions and your example and your words that your wife and children have every opportunity to be transformed by the Word of God, into the people that God created them to be. That’s really our bottom line responsibility as husbands – it’s to help our wife and children become the people that God created them to be. And so I think we’ve begun to get an idea of what Christlike servant leadership looks like – and so today I want to focus on those last two parts of that definition – the husband’s responsibility for protection and provision in the home. Now again, these roles and responsibilities aren’t based on what’s culturally acceptable or the capabilities of men or women, or any thing like that. Paul tells us that Christ cares for his body (the church) just the same as anyone cares for and feeds their own body. Now I would think that most of us take pretty good care of our own bodies. We make sure we’re well-fed, we’re dressed warm for the weather, we don’t go around purposely hurting ourselves – and if we do hurt ourselves by accident, we nurse our wounds or we go see a doctor. We put ourselves to bed when we get tired – we do all that we can to make sure that we are well taken care of, comfortable and happy. It’s self-evident that no normal person neglects their own body. We keep it from harm, we feed and care for it the best we know how. God is not some aloof God way out there somewhere in the cosmos who is unconcerned and uninvolved in your life. Quite the opposite. If God cares for flowers – that sprout up and die within days, how much more does God care for you – someone created in His own image – someone created to exist for eternity?! Of all the things that God cares about, you are his primary concern! In fact, God’s concern and care for you is greater than your own concern and care for your own body. Just like how you are aware of your own body – you know when you’re hungry, when you’re hurt, when you feel sick, when you are excited, all that stuff — in a similar same way, God knows everything about you. You couldn’t even count the number of thoughts that God has about you. That’s how constant and intimate God’s care is for you. And husbands are to mimic that same level of care and concern for their wives that God has for us – and that you have for your own body. Now granted, we do not have the same capacity to love our wives in the exact same way that God loves us – but we are to love our wives in the same way as we love our own bodies. We are to invest as much energy into providing for and protecting our wives as we do providing for and protecting ourselves! And it make sense that we do that because when we care for our bodies, we are really caring for ourselves – right? Me and my body are one. I want my body to be safe and well taken care of. A man who loves his wife actually show love for himself because he is one with his wife. It really is in your best interest to care for your wife like you care for your own body because the two of you are one. When she flourishes, you will flourish. So here’s a question for you: Is your wife flourishing under your care and protection? Now I’m sure that every one of you husbands are doing your best to put food on the table and to make sure that no one breaks into your home to hurt your family. I would hope that’s a given. But I would also hope, that that’s only just the beginning. Our job as husbands, to provide for and to protect our wives, goes far beyond just bringing home the bacon and getting up in the middle of the night to see what that sound was. That’s like the bare minimum. That’s like how I care for my fig tree. I showed you earlier that my fig tree, while still alive, is certainly not thriving. I’ve brought it inside to keep it from freezing and I’ve given it enough food and water to give it a good chance of survival, but by no means is it flourishing. But… if I’d have cared for that fig tree like I cared for myself, things would be very different. If I cared for that fig tree like I cared for myself, I imagine I’d have built a beautiful atrium for this fig tree to live in. I would carefully till the soil and add abundant nutrients and water, I’d keep all the destructive bugs away and quickly treat any diseases – I might even add in some artificial lighting to help it through the dark days of winter…. and if I did all that, without a doubt, that fig tree would flourish! It would grow big and tall and strong, it would be full of healthy leaves and flowers and it would quickly produce fruit – delicious figs! That’s what we want to see in our marriages. It’s not good enough that our wives merely survive. Our job us to help them flourish! We don’t want to provide and protect at the bare minimum level – we want to care for our wives like we care for our own bodies. I was reading through Ruth this week and I think her husband, Boaz is probably one of the best examples in the Bible of how to care for your wife like you care for your own body. Now granted, most of the impressive stuff that Boaz does happens before they even get married – but if this is any indication of Boaz’s true character (and I think it is), I can only imagine how well that man would have cared for his wife after they were married! But let me just read you a few snippets from Ruth chapter 2. Just to give you the context here – Boaz was a farmer and it was harvest time. The laws of the land said that when you harvest your field, the poor and those in need could come in behind and pick up any leftovers or any grain that got missed. And so that’s what Ruth was doing. She was a widow and so she her plan was to come in behind the workers to see what bits she could gather up so she and her mother-in-law could survive. But watch what Boaz does – see how he provides for and protects this girl. Ruth chapter 2, starting at verse 5. He doesn’t just want to see her survive – he wants to see her flourish! He is going way out of his way to provide for and to protect Ruth. Boaz was following the golden rule before Jesus ever said it. Do you kids know the golden rule? That’s a rule we should follow in all of our dealings with everyone. Whatever we want people to do to us – that’s what we should do to them. If we don’t want people to treat us a certain way, then we surely shouldn’t treat them that way. Do to others whatever you would like them to do to you. And if that’s true for everyone, how much more so should we as husbands do that for our wives? I think maybe that’s why Paul stresses that point – husbands, love your wife as you love your own body. So let’s get practical. Husbands, what do we need to do to love our wives like we love our own bodies? Well, for starters, we need to know our wives like we know our own bodies. We are constantly aware of the state of our own bodies – we know our body’s needs, we know it’s hurts, we know what it wants…. We never forget or miss the message that we’re hungry or tired or that we stubbed our toe. We’re well aware of that. Is that how well we know the needs, hurts, and desires of our wives? We talked earlier about how God knows everything about us and how he cares for us intimately. Do you know your wife like that? Are you aware of her struggles so that you can provide help for her in those struggles? Are you aware of her hurts so that you can protect her from further hurt and help bring healing? Are you aware of the things she longs for so that you can provide those things for her? God has the advantage of being omniscient! He knows our deepest needs without us ever having to say a thing. Husbands don’t have that advantage. If you don’t take the time and make the effort to really know your wife, you simply won’t know your wife well enough to provide for what she really needs and to protect her from the things that hurt the most. And by the way, do you want to know a sure fire way to help you get know your wife like that? It might surprise you to know that praying with your wife can be one of the most personal, intimate things you can experience with your wife. It’s true. Perhaps even more than some other personal, intimate experiences with your wife. Praying together is powerful stuff. They say that the family who prays together, stays together. And I’d believe it. When you develop that habit of praying together – bringing your concerns and hurts and requests to God together, that really provides a window into each other’s lives. And of course, praying together certainly isn’t the only way to get to know your wife – but through praying together, you quickly become aware of your spouse’s deepest concerns and needs and fears – and then when you become aware of those things, you can do whatever is in your power to provide for your wife and to protect her. So to close this morning, I’d just encourage you husbands – Don’t allow your wife to end up like my fig tree. Your responsibilities to provide for and to protect your wife go far beyond just bringing home the bacon and getting up in the night to see what that sound was. Don’t just do the bare minimum. You’ve got to care for that girl like you care for your own body. Know her as well as you know your own body. And then provide for her and protect her so that she doesn’t just survive – but she flourishes. Jesus came to give us abundant life – not just survival. He wants us to flourish under His care and protection. Husbands, let’s mimic our Lord and Saviour. Let’s love our wives like Christ loves us.